While many believe this whole ordeal was like that out of a science fiction film, the bright blue sky many faced just days ago seems to have been explained. 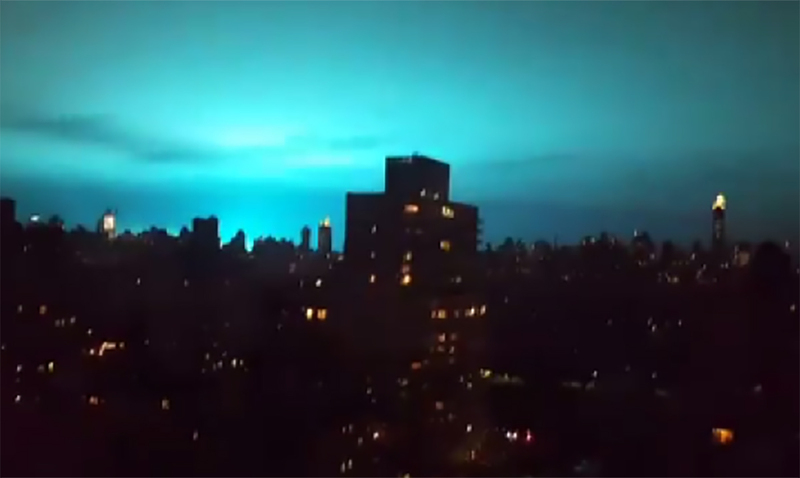 This mysterious bright blue light lit up the sky in New York City and had many quite concerned on December 27th. The official explanation for this whole ordeal was that there was an explosion of some kind of electrical transformer at a Con Ed Facility in Queens. Basically, the voltage is said to have created an electrical field strong enough to literally strip electrons from atoms and ended up doing some pretty interesting things or so the WSJ has reported. There was a boom; then a hum. The lights flickered. A giant plume of smoke filled the New York City sky around 9:12 p.m., and turned it blue. “A sort of unnatural, fluorescent shade of blue,” said Bill San Antonio, 28, who was watching Thursday night from inside a terminal at La Guardia Airport. “We thought it was a U.F.O.,” said Yiota Androtsakis, a longtime Astoria resident. Ms. Androtsakis was not the only one. In the earliest moments, hundreds of Twitter users from across the city posted videos of the eerie lights, causing many on social media to fear an alien invasion. By late Thursday night officials said the event was caused by nothing more than a transformer explosion. That being said, while even Con Edison has made statements on the matter many do not believe the current narrative. There have been several ‘conspiracy’ videos brought forth already on the topic and many believe the idea of it stemming from a mere transformer explosion to be quite odd. An interesting coincidence was that on the same day, several areas happened to be cut off from the 911 emergency service system and an internet outage occurred. Even now the ordeal is thought to be something we’ve never seen before. The sky lit up in that manner was more than enough for most of us to assume the end of the world was near. According to NBC Sandiego, NYPD officials said on scene that the explosion was caused by some kind of equipment malfunction and that it did not seem deliberate. That being said even if in the future it turns out to be something else entirely there is no denying the marvel that it was. Now while the internet/service outage began early that Thursday it went on well into the same night. Not much was revealed on the topic and details were kept quite ‘hush-hush.’ CenturyLink customers from New York all the way to California were affected in some cases and many were quite concerned. When dialing 911, they would be given the ‘busy’ signal and who knows how many might have been in danger over such. Currently, all major transmission lines have been restored according to the company and those who were in the dark are fine. Investigations on the internet outage are underway to be safe but aside from that, we do not know much just yet. What do you think about the whole situation? I for one think there is a chance that something more could be going unnoticed. To hear more about the theory behind how these things could be connected please check out the video below. Lots of questions are being raised, to say the least.